People are fleeing their homes and seeking asylum in the US: Now is the time to open the borders! A migrant caravan heading to the United States of people seeking asylum was halted at the border between Guatemala and Mexico on Friday. Fleeing violence and economic insecurity, and seeking the possibility of returning to the United States to reunite with loved ones, the numbers swelled to over 5,000 people as they marched towards the Mexican town of Tapachula. 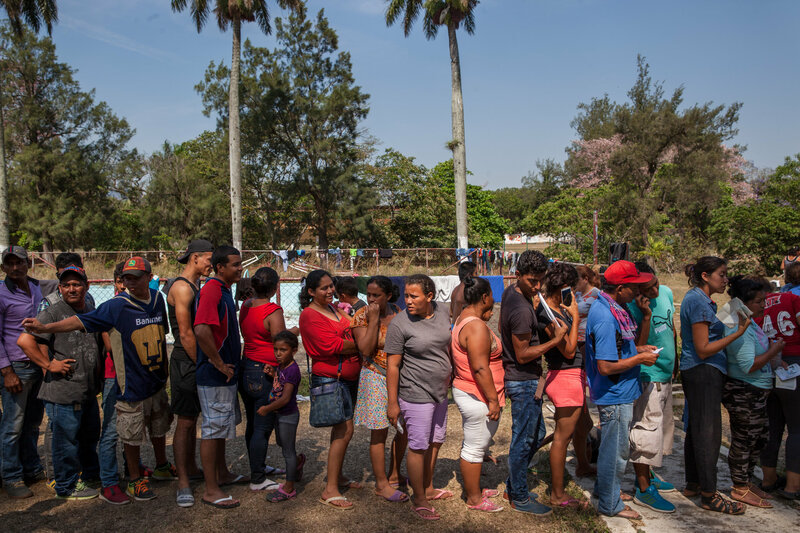 Despite efforts to stop them at the Mexican border, asylum seekers marched to the bridge crossing the Suchiate River, then moving through a park in the border city of Ciudad Hildago to bypass the slow process of entering Mexico legally. Some crossed the river on rafts, by swimming/wading through the river in full view of Mexican police blockading the bridge; others paid locals to ferry them across the river. They did not face detention upon reaching the Mexican bank. Though they faced threats from the United States, their final intended destination, locals in Guatemala and Mexico encouraged those traveling with applause, cheers, and donations of food and clothing. A resident of the neighborhood of Lorenzo, Maria Teresa Orellana, handed out free sandals to migrants as they passed. “It’s solidarity. They’re our brothers,” she said. Mexican workers handed food and bottled waters to migrants on the bridge, while a doctor gave medical attention to a woman who was fearful that her son was running a fever. Guatemalan locals also donated food and water to travelers as well. Crowds on the Mexican side of the river cheered the caravan, shouting, “Venganse!”-Come on in! 7,233 immigrants had registered over the past three days at a shelter at Ciudad Hidalgo. Gerardo Hernandez, head of the local government’s emergency services, has said that his agency has been asked to help provide the immigrants with food and shelter. Sunday night, one of the group’s organizer, Rodrigo Aveja, reported that the caravan included at least 5,600 people. On October 13, an estimated 3,000 migrants marched out of San Pedro Sula, Honduras. Their goal was to walk through Guatemala and Mexico to the United States. Though their numbers have ebbed and flowed, on Sunday the caravan was at its largest, with migrants determined to cross the US-Mexico border. “We are going to get to the border of the U.S. I am not going to stop. I don’t care if I die,” said Luis Puerto, 39, of Colon, Honduras. Fear drives many migrants to leave their home, many coming from El Salvador and Honduras. With 60 murders per 100,000 in 2017, El Salvador was considered the deadliest place in the world of countries not at war. Last year, almost 4,000 people were killed in El Salvador. Honduras’s 2017 murder rate was 42.8 murders per 100,000 people, making it one of the world’s most dangerous places to live. On June 11, Attorney General Jeff Sessions asserted that women escaping domestic abuse were not eligible for asylum, upending decades of legal precedent and potentially violating international law. International refugee law requires signatory countries to offer protection to people who demonstrate a well-founded fear of certain kinds of severe harm in their home countries. Women who experience severe sexual or physical violence at home in countries that cannot or will not protect may qualify as members of a “particular social group” that warrants protection and previously would be eligible for asylum within the United States. Central Americans are also fleeing home because of gang violence. Many are caught in the crosshairs between violent gangs and violent police. Many migrants in the caravan had previously lived in the United States; many joined the migration to reunite with children or resume jobs. Some of them had returned to their home countries voluntarily, but eventually determined that there was nothing left there for them. The deportees and returnees were clear that their intentions were to cross the border against the wishes of the current administration, risking detention and deportation to be back with their loved ones again. Some were hoping to slip past border patrol officers, with no intention of applying for asylum. While the caravan continues its way North, the Trump administration will continue to threaten military violence against women, children, and men. The military is not the answer. It is up to us civilians to answer the Caravan’s call and abolish the borders that would keep these people fleeing for their lives from entering the United States, some looking for a better life, some wanting to return to their children and their families. Now is the time to open the borders!